I have a fascination for maps. Whenever we plan a trip, I spend a lot of time looking at different maps, checking locations and possible routes. I think my fascination has to do with the possibilities I see when I look at a map, not just for routes, but for experiences. Curiosity about a new place leads to dreams about traveling there. It's all about possibilities. 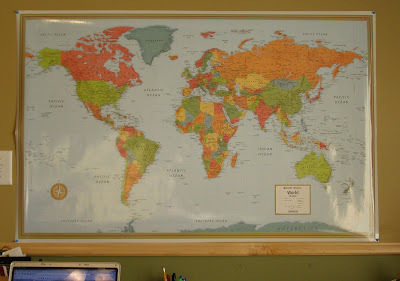 I recently put a 50x32" map on the wall over my desk (see quickly taken picture above). I like to look at it when I read about places people are living in or traveling to. The boys will look at the map and ask questions, too, which I think is great.